There are numerous benefits in replacing carburetors with electronic fuel injection (EFI) for fuel delivery on UAV engines. However, the achievement of these benefits necessitates a comprehensive integration and calibration for each engine installation. Only companies that have the extensive experience and appropriate equipment can successfully undertake these tasks. Currawong Engineering is a world leader in designing, manufacturing, integrating and calibrating EFI systems for various small engines, both two and four strokes. Carburetors provide fuel control by purely fluid dynamic means, utilising jets and similar devices to control fuel flow while sliding or rotating valves control airflow. The relationship between the airflow and the fuel flow is essentially adjusted mechanically, but various methods have been used over the years in an attempt to provide a form of compensation for different operating conditions. Small carburetors are usually very basic and do not incorporate the advanced compensation devices found on larger carburetors. However, even if small carburetors could be equipped with larger standard compensating systems, the end result would not be as effective as EFI. In EFI systems, the carburetor is eliminated. Airflow regulation continues to be achieved using a butterfly or a rotating valve, but an electronically controlled fuel injector delivers the required quantity of fuel. The amount of fuel and the amount of air delivered can be regulated independently. The system provides the required fuel/air delivery based on the information provided by various sensors. These include the inlet manifold air and cylinder head temperature sensors, the crank position sensor, the barometric and manifold pressure sensors and the throttle position sensor. 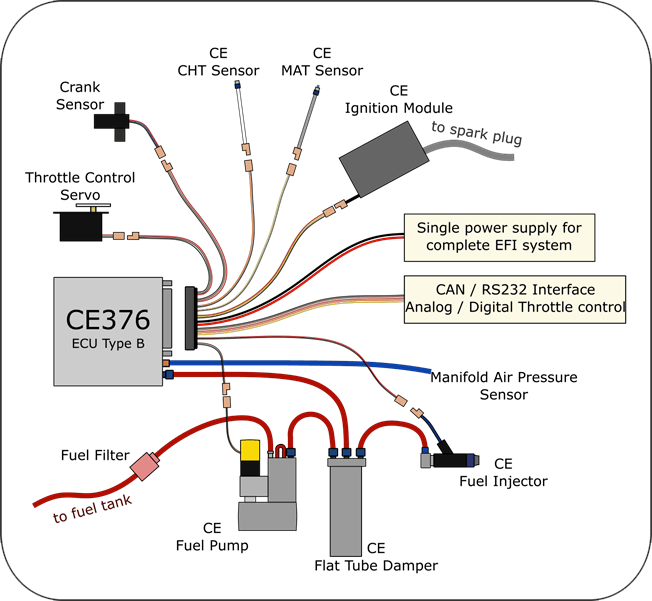 An electronic control unit (ECU) performs the computations that are required to optimise both fuel delivery and the ignition timing. In summary, EFI systems enable the fuel/air ratio to be continuously adjusted according to the operating conditions (altitude, ambient temperature etc) and the engine requirements (throttle opening, power/overrun conditions, cold/hot start etc). EFI systems invariably produce lower fuel consumption than carbureted engines. This follows from the sophistication of the electronic control system that constantly monitors and adjusts the air/fuel ratio to maintain optimal combustion conditions. Small carburetors tend to deliver a rich mixture (excessive fuel to air ratio) at both low power output and at high power output. Carburetors are particularly inefficient when used in varying power conditions, as it is difficult to optimise the air fuel ratio for all throttle settings. Effective altitude compensation is difficult to achieve with carburetors, whereas with EFI, altitude compensation is built into the system and works seamlessly. Whilst the precise fuel consumption reduction will vary from engine to engine and duty cycle to duty cycle, it is reasonable to expect a reduction in fuel consumption of 15% to 30% following conversion of a carbureted engine to EFI. This applies to both two and four stroke engines. Currawong has a heavy fuel variant of its EFI system that capitalises on the precision fuel delivery performance of EFI. The heavy fuel system supports operation with Jet-A, JP-5 and JP-8 fuels. It is extremely difficult to operate a small engine on heavy fuel using carburetors, although attempts have been made by others to do this. EFI, in conjunction with other proprietary Currawong design advances, is the key to effective and efficient heavy fuel operation. EFI equipped engines generally provide higher power and torque output than a carbureted version of the same engine. It is difficult to optimise power and/or torque across a wide range of engine speeds with carburetors, whereas EFI systems are capable of optimising air/fuel ratios and ignition timing over the whole range of operating speeds while at the same time compensating for other factors in order to maintain optimum performance on a continuous basis. Typically EFI equipped engines produce around 5% to 10% more power than a carbureted version of the same engine. Engines equipped with EFI systems are inherently more reliable than carbureted engines. This follows from the ability of the EFI control systems to maintain optimum air/fuel ratios during all phases of flight. EFI systems are far less susceptible to icing, compared to carburetors. Random engine stoppages, oiled spark plugs and other problems associated with sub-optimal air fuel ratios are eliminated. Carburetors tend to go out of tune. This necessitates constant adjustment and a significant risk of failure on long missions due to drift in the settings. EFI engines on the other hand remain constantly in the same state of tune. This not only improves reliability but also reduces the amount of routine maintenance that is required. A major benefit of EFI systems is the greatly improved cold and hot starting performance. This follows from the ability of the system to calculate the optimum air/fuel mixture for starting as well as from the superior atomisation that results from injection of the fuel as compared to fuel delivery from a carburetor. Two stroke engines are notoriously difficult to start in standard form, but with EFI they become as easy to start as a four stroke. The ability of an engine to be started under a wide range of operating conditions, from very hot to very cold ambient temperatures, from sea level to high altitude and from engine temperatures that range from cold start to hot start is vitally important in UAV operations. It is particularly critical to hybrid propulsion systems where the engine may be stopped and re-started during flight. Currawong EFI systems have been developed to have optimum altitude compensation. Ambient air pressure is continually monitored and the ECU continuously calculates the ideal air/fuel ratio for that altitude while also optimising the air/fuel ratio for the other variables (temperature, throttle position etc). It is difficult to achieve altitude compensation with carbureted engines, particularly where operation at varying altitude is required. Invariably a compromise carburetor setting is required, meaning that at least part of the time the air/fuel mixture is not optimal, resulting in excessive fuel consumption when the mixture is over-rich in fuel and potential damage to the engine when the mixture is over-lean. Because EFI systems are electronically managed, integration with on-board avionics systems is not only possible, but is also widely applied. Off the shelf, Currawong EFI systems are integrated with the Cloud Cap Technology range of Piccolo avionics. In addition, through the open and fully documented API and the CAN interface, the Currawong EFI system can be readily integrated with other avionics systems. The following diagram illustrates the typical setup of Currawong’s EFI system.